Gabon’s president, Ali Bongo, intends to use his country’s two-year seat on the United Nations Security Council to highlight democratic reforms and his fight against corruption, which he terms a “cancer” sapping Africa’s strength and potential. “Unfortunately, when it comes to the African body, we have many diseases — and corruption is one of them,” Bongo said in an interview after meeting with U.S. Secretary of State Hillary Clinton March 8 at the State Department. Gabon, with a population of fewer than 2 million, is largely dependent on the energy and extractive (mining and timber) sectors and is the fifth-largest supplier of oil in sub-Saharan Africa to the United States. In 2009, the non-government group Transparency International rated the nation 106 out of 180 countries in its annual corruption index, tied with Argentina, The Gambia, Niger and Benin. At the same time, he streamlined government by eliminating several agencies and bureaucracies that were hindering innovation and investment in Gabon. He has also threatened criminal penalties for persons attempting to bribe public officials, according to a recent press report. Acknowledging Gabon’s new responsibilities on the U.N. Security Council, Bongo said, “We are going to work very closely with the United States and all the permanent members of the Security Council to make sure that the world is a better place.” He had earlier addressed the Security Council, which Gabon chairs for the month of March. Speaking to the press after her private meeting with the African leader, Secretary Clinton said, “I want to recognize President Bongo’s efforts to improve government efficiency, eliminate waste and fight corruption. “We know, as the president knows, that economic progress depends on responsible governance that rejects corruption, enforces the rule of law, provides good stewardship of natural resources and delivers results that help to change people’s lives for the better. 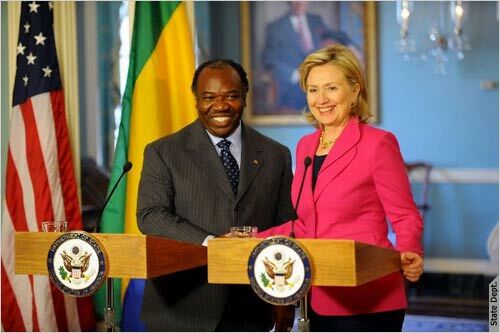 “We stand ready to support Gabon as it further strengthens its democratic institutions and processes,” Clinton said. • Ivory Coast: Both Gbagbo and Ouattarra isolated?